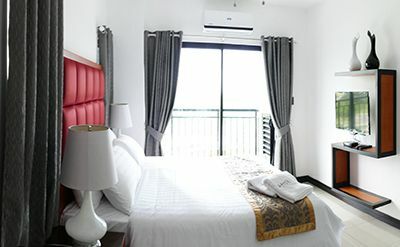 Our studio condominiums are approximately 34 square meters, including the bedroom, living room, kitchen, toilet/bath, and balcony. Each condo is furnished with a plush King Sized bed with Headboard, 4 pillows, 2 nightstands, lamps, a refrigerator, split air conditioning unit, minimum 32" TV, Cable TV WiFi, Microwave, Electric Stovetop, Range Hood, Water Heater, and Wardrobe Closet. There is also a small seating area that includes either a couch with coffee table or 2 chairs with a small table. Each kitchen is equipped with cutlery and dishware. 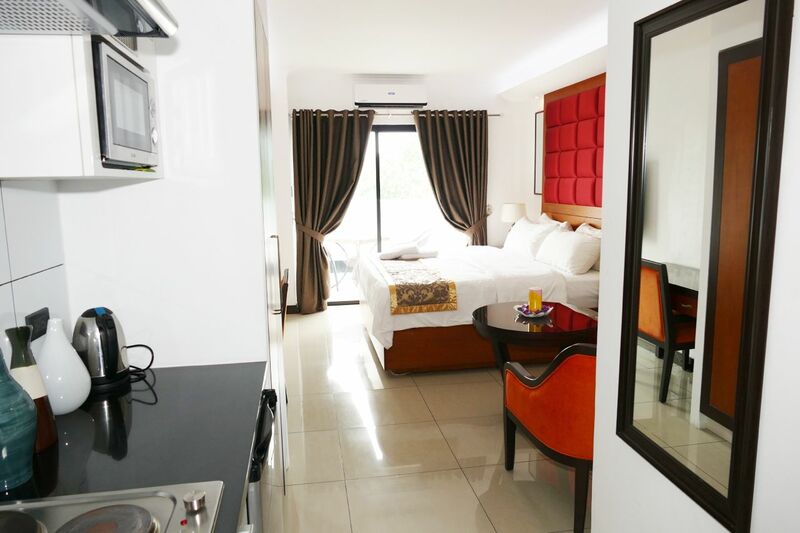 Our one-bedroom condominiums are approximately 64 square meters, including the bedroom, living room, kitchen, toilet/bath, and two balconies. Each condo is furnished with a plush King Sized bed with Headboard, 4 pillows, 2 nightstands, lamps, a refrigerator, split air conditioning units, two minimum 32" TV's (one in the bedroom and one in the living room), Cable TV, WiFi, Microwave, Electric Stovetop, Range Hood, Water Heater, and Wardrobe Closet. Each living room has a couch with end tables, a coffee table, and a balcony. 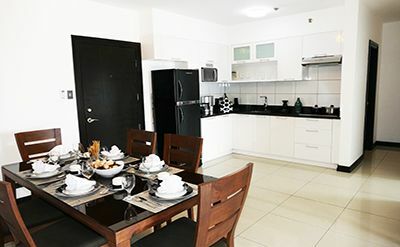 Each kitchen is equipped with cutlery and dishware, and the dining area has a dining table with 4 chairs. 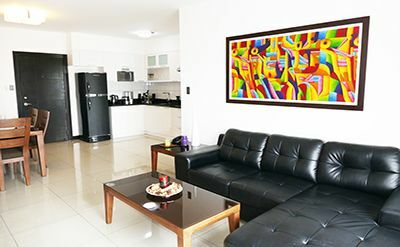 Our two-bedroom condominiums are approximately 100 square meters, including two bedrooms, a living room, kitchen, toilet/bath, and three balconies. Each condo is furnished with a plush King Sized bed with Headboard, 4 pillows, 2 nightstands, lamps, a refrigerator, split air conditioning units, three minimum 32" TV's (one in the bedroom and one in the living room), Cable TV, WiFi, Microwave, Electric Stovetop, Range Hood, Water Heater, and Wardrobe Closet. Each living room has a couch with end tables, a coffee table, and a balcony. 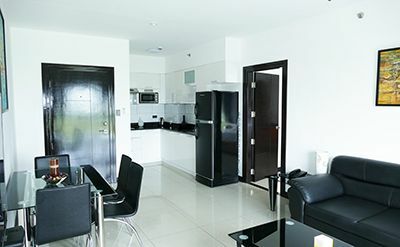 Each kitchen is equipped with cutlery and dishware, and the dining area has a dining table with 4 chairs. 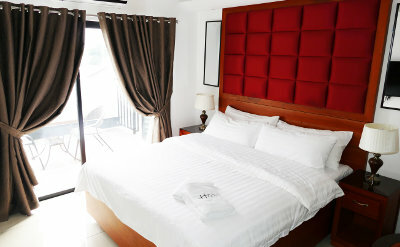 Daily rates are available on request subject to one week minimum stay. Rental rates are exclusive of Utility Bills which are charged separately. Cable TV is an additional P750 per month. LAN internet is free of charge. P500 per month additional for a personal wireless router.